Owning the Family Home and buying an investment property using the equity in the family home as part of the investment capital is a frequently considered strategy. There are valid reasons to look beyond a residential investment and consider the inclusion of commercial property in an investment strategy. Commercial property is an income investment, usually providing higher yields and steady long term capital growth. These yields (which comprise the main component of the total return) are usually backed by commercial rent agreements creating a greater level of certainty on short to medium term returns. 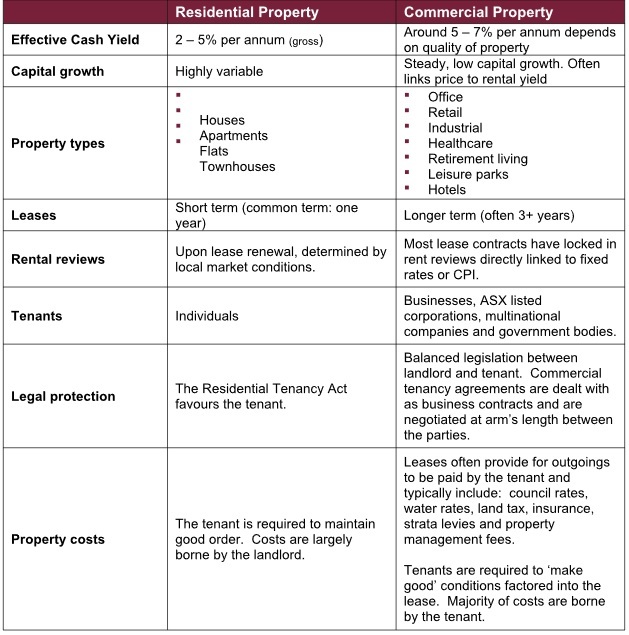 Most commercial leases have contracted rent reviews (generally meaning that the rent cannot drop) directly linked to CPI, fixed rates or market based reviews. Conversely, residential property is often considered a high growth and low yielding asset. The potential for capital growth can be high, but reliance on potential growth returns from property needs to be considered relative to, the cash flow requirements of debt funding. The low initial yield that Australian residential property investors accept presumes an inversely high level of capital growth.